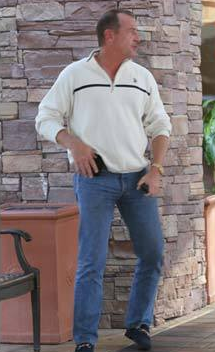 Michael Lohan was spotted this morning outside a hotel just a few miles from The Betty Ford Clinic in his tireless attempt to interfere in Lindsay’s life under the guise of being involved in her therapy. This happens to be ‘Family Week’ at the clinic and naturally Michael is trying to take advantage of this to get some face time with his meal ticket, whoops, I mean his daughter, Lindsay. Short of being allowed into seeing Lindsay, which seems unlikely since she does not want to see him and both her and mom Dina have legal restraining orders in effect against him, he has apparently written a letter which he hopes the staff at Betty Ford will drop off to Lindsay for him. Of course Dina will be allowed in to see Lindsay but it doesn’t look as promising for Michael. Michael said that since Lindsay claims he is largely to blame for her problems then he naturally should be involved in her therapy. To quote the self-righteous and greedy piece of work, “If Lindsay’s problems stem from me, then I should be involved in the treatment … right?” No Papa – WRONG! There is no logic in his reasoning at all. If one was burned in a fire does mean that the therapy should include flame? If one almost drowns do you heal the victim by submerging them in water? Do you cure an alcoholic by taking them out for a drink? Michael Lohan is a snake whos only demonstrated interest in Lindsay is to get as close to her as possible because he is able to make his relationship with her pay off in dollars. He is a man who actually sold his private taped phone calls with his troubled daughter to Radar On Line – profiting from her pain as well as exposing her private life! Michael Lohan is scum. This creep should never be allowed any contact with Lindsay – any claims he makes to caring deeply about his troubled daughter are false. He is simply very bitter about the fact that she won’t give him the access to her that would earn him a fortune and you can see it in his face. Will Michael Lohan get a conservatorship over Lindsay Lohan?